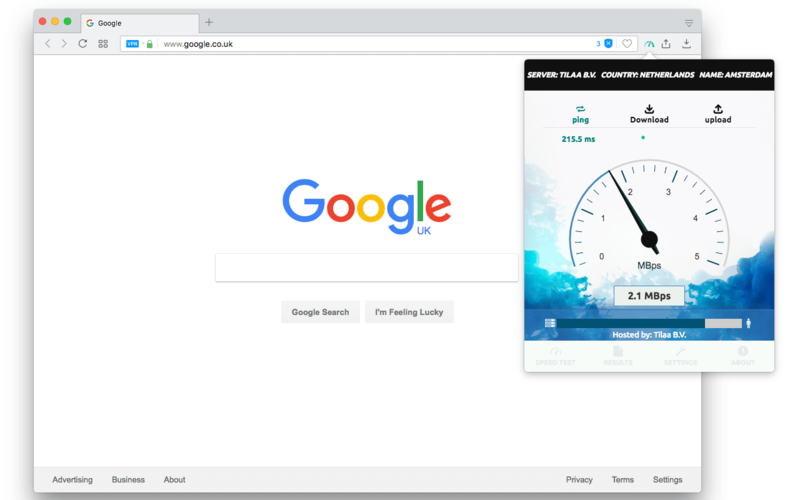 "Internet Speed Test" provides a toolbar panel for measuring your connection speed to the nearest Ookla server. This extension measures uploading and downloading speeds. You can either allow the extension to find the fastest Ookla server for speed measurement which estimates the maximum possible connection speed, or you can set a custom Ookla server in the settings tab to find your actual (realistic) speed when connecting to that particular region. The extension stores the last 10 speed measurements for review and comparison. What is "Internet Speed Test" extension and how does it work? "Internet Speed Test" is a simple tool to measure network connection speed either to the nearest speed test server or to a user defined server. To measure downloading speed, the extension first determines your estimated speed and then a proper file is selected from the speed test server. Up to four concurrent connections are made with one-second delays. The total bytes that are received during the measurement is used to find your average speed and the total bytes that are received during a second generates your connection speed per second (real-time speed). This way you can find both internet speed and fluctuations. For uploading test, a random file is generated and this file gets uploaded to the pre-defined server. Like downloading test, multiple connections are placed to make sure the full bandwidth is used. Note: It is recommended to not use other internet consuming tools while measuring speed for better accuracy. Also, you can run speed test several times to make sure the value is accurate. How does the default server get selected and how can I define a custom location? There are many internet speed test servers offered by Internet service providers (ISPs). When the extension gets started, based on your IP address, five nearest servers are selected, then a single package is sent to each server and the extension waits for replies. When all replies are received, the fastest server is selected among these five servers. Note that based on the server status, maybe the nearest server is not the fastest one. When a server is selected, both downloading and uploading requests are sent and received from this particular server. It is also possible to define a custom server from the settings tab. To do so, wait for the panel to initialized. Then go to the settings tab and select a new server. It is usually recommended to select a server from a location that you are mostly get connected to. For instance, if the website that you are visiting frequently is located in Germany, then select a server in this country. This will provide you with a more realistic speed.